Of a terrible battle that happen’d of late. When he hears of our once-noble Cumberland’s fate. By the heroic deeds of the Cumberland’s crew. That told every seaman to stand by his gun. Determined to capture our Cumberland’s crew. And to die for our country we are not afraid. To the Stars and the Stripes we will ever prove true. He was answered by cheers from the Cumberland’s crew. When our shots struck her side and glanced harmlessly o’er. It was nailed to the mast by the Cumberland’s crew. “Let us die at our guns,” says the Cumberland’s crew. The light of this world they will never see more. Or die at our guns like the Cumberland’s crew. The most famous naval battle of the American Civil War is surely that between the Monitor and the Virginia (formerly the Merrimack). But the first “battle of ironclads” was not the whole of the Battle of Hampton Roads. Hampton Roads is at the southern end of Chesapeake Bay; it is the outlet to the sea for both Washington, D.C., and Richmond, the Confederate capitol. A blockade of the Confederacy was one of the key Federal strategies of the war, and Hampton Roads was one of the key points of the blockade — if the Confederates could somehow break the blockade there, it would not only open Richmond to the world (important, since Richmond had a large fraction of the tiny Confederate industrial base), but it might even let the Confederates counter-blockade Washington. Naturally the Southerners scraped around for something they could use to break the blockade. The Federals had given them a great gift: The Norfolk navy yard was the best in the nation, and the Union officers there, when they evacuated, had left the yard almost intact. (They had orders to wreck the place, but the officer in charge was a senile old fool and muffed it.) 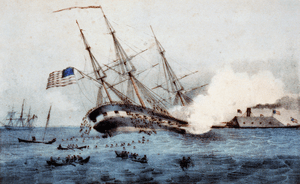 The officers did at least decide to scuttle the Merrimack, a steam frigate which, if her engines had worked decently, would have been one of the best ships in the Navy. But so incompetent were the officers on the scene that they couldn’t even scuttle a ship decently; they set her on fire and flooded her, so that the rising waters put out the flames. The Merrimack had no upper works left, but her hull was intact and her engines were about as good as they had ever been (i.e. terrible). The Confederates built a new superstructure over the hull, plated it with iron, stuffed her with cannon, renamed her the Virginia — and set out to destroy the Union blockade. April 8, 1862, the Virginia set out to try her systems and attack the blockaders. There were five ships guarding the Roads at the time, the U. S. S. Congress, Cumberland, Minnesota, Roanoke, and St. Lawrence. The latter three were steam frigates (sisters or near-sisters of the Merrimack, in fact); the former two were sailing vessels. The Cumberland had a fairly distinguished record, and had managed to escape Norfolk when that city fell to the Confederates. But April 8 was a calm day, making it hard for her to maneuver. She became the Virginia’s first target. On that first day of the Battle of Hampton Roads, the Virginia sank first the Cumberland and then the Congress, and drove the Minnesota aground, as well as chasing the other ships out of the Roads. It was an overwhelming Confederate victory — but it wasn’t totally one-sided. Even as the Virginia charged the Cumberland and rammed her (dooming the ship, of course), the Cumberland poured broadside after broadside into the Confederate ship. They couldn’t pierce her armor. But they shot off her smokestack (making her even slower than she was before), destroyed her upper works, damaged one of her cannon, opened slow leaks in some of her seams, and broke off her ram. The Virginia was a far less effective ship on day two of the battle than on day one, and it was almost entirely because of the Cumberland. 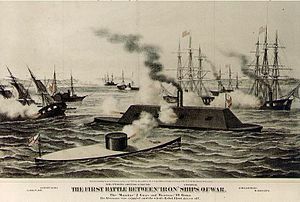 The next day, the union Monitor arrived, and she was able to hold off the Virginia. That meant that the Union could bring back its other ships, restart the blockade — and bring ocean traffic back to Washington. Although tactically the Union lost at Hampton Roads, it was a strategic victory. And, given how close the contest was between the Virginia and the Monitor, it’s just possible that the Monitor survived because of what the Cumberland had done. Had the Virginia still had her smokestack, and had her ram been intact, it’s barely possible that she could have sunk the Monitor as she had sunk the Cumberland. In the actual battle, she tried and failed. Curiously, although there is a broadside from as early as 1865, there seems to be no information about who wrote this song. The Minnesota (named for the river, not the state, which had not yet entered the Union when the class was commissioned) bears another minor historical distinction. When the Civil War began, neither side accepted Blacks into its army. The Union navy was a little more open, but only slightly — at first, Blacks were only accepted for the dirtiest jobs such as firemen and stokers; the skilled tasks were reserved for white sailors — and, of course, all the officers were white. In 1861, however, a group of contrabands were formed into a gun crew on the Minnesota, making them the first Blacks to serve in a true combat job in either Union or Confederate forces (McPherson, pp. 563-564). I do not know if they were the first to participate in real naval combat (there may have been Blacks on some of Farragut’s ships at New Orleans), but it seems likely. They were not, we should note, the first Blacks to serve in the American armed forces; Blacks fought in the Revolutionary War. But attitudes had stiffened after that. Those sailors on the Minnesota might be called the first Blacks of the modern navy. There would, of course, be many more; by 1864, the Union army had whole divisions of “colored” soldiers, and by 1865, even the Confederacy was talking of arming Blacks. We might add that, though the soldiers of the First Minnesota Regiment did not see the Battle of Hampton Roads (they were still in the vicinity of Washington at the time), they did see the Monitor as they sailed south to take part in the Peninsular Campaign (so Richard Moe, The First Volunteers, Minnesota Historical Society Press, 1993, 2001, p. 124). Source: Even though this song is about a battle at sea (well, in a harbor), and has been found as far away as King’s Lynn in England and Wexford in Ireland, it has been surprisingly popular in the Great Lakes region, with versions found in Flint, Michigan; Crandon and Isabella, Wisconsin (the former from the great Warde Ford, perhaps the most important informant from the Upper Midwest); and Toronto and Peterborough, Ontario. Plus Dean sang it. We are lucky to have both Dean’s text and his tune; the text here is from Dean, and the tune is as Rickaby collected it from Dean. The tune is interesting. Although written in one flat (i.e. presumably in the key of D minor), in fact it is in G minor, using the Dorian mode, and even that is wobbly; there are a lot of major thirds, meaning that the song is somewhere between Dorian and Mixolydian. It’s a very impressive tune, but harmonization can be tricky. I’ve included guitar chords, but the song works well when sung a capella.